Batman v. Superman. It’s not a great title, is it? In fact, it doesn’t get a hell of a lot better when you add the subtitle Dawn of Justice. Nevertheless, I find the idea of Bats versus Supes interesting. Oh, not in how it plays out on the big screen. Every crossover comic ever has a scene where the two main characters duke it out for a bit, and then realise that they’re really on the same side. Daredevil/Batman? Check. Punisher/Batman? Check. JLA/Avengers? Yarp. If there’s a winner, it’s normally a foregone conclusion (Hulk vs. Iron man in Avengers: Age of Ultron, anyone?) so there’s never any real dramatic tension to be had. Without drama, you’re really just judging one fight scene against another, and such fight scenes almost always feel disconnected from the rest of the story because, by their nature, they’re contrived as hell. No, the Bats versus Supes idea I’m interested in is the one that plays out in the real world. Batman and Superman are two of DC’s ‘Trinity’ (the third member being the oft-overlooked Wonder Woman). It’s a grouping that’s served DC well for decades, even to the point that Marvel had a crack at copying the format, establishing Iron Man, Captain America and Thor as the core of the Avengers. Supposedly, the Trinity are equals, but the truth is that Batman’s far more popular than his comrades – just look at the range of comics published under the Batman brand, the slew of tie-in media, etc. Leaving Wonder Woman aside (which, to be fair, is what DC and Warner Brothers do at every opportunity), I’m proud to say that Superman is favourite. 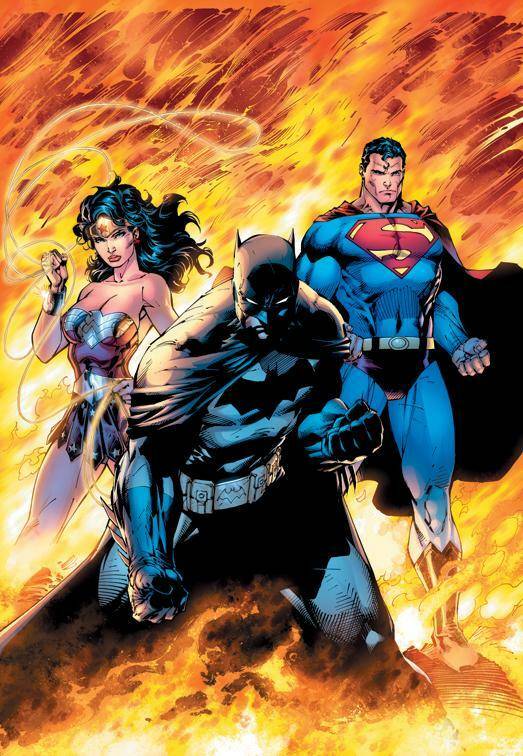 The DC Trinity: Sure, Batman can lead the charge. After all, he’s the invulnerable one. Don’t misunderstand. I like both Batman and Superman. This isn’t about ‘better’ – it’s about what resonates with me more. Oddly, when you get down to it, Batman is easier to identify with. He’s an ‘ordinary’ man, not some god-like alien from another world. Ulimately, a stinking great pile of cash is the only thing that separates him from you and me. After all, when you don’t have to worry about money, there’s plenty of free time to hone yourself into the World’s Greatest Detective. Okay, so that’s not entirely true, but we’ve all thought it. Yes, even you. I know you have. And that’s the point. Batman inspires precisely because we can put ourselves in his utility belt. Whether he’s slugging away at the undying hydra that is the Gotham underworld, or battling Darkseid as part of the Justice League, he’s an ordinary guy, punching above his weight. He’s us. Crime-fighting isn’t a sacrifice to Batman. Depending on how charitable you’re feeling, it’s either a testament to his long-dead parents, or a deep-rooted psychosis as crippling as any to be found in Arkham Asylum. It defines him. It’s who he is. He has no private life to put on hold, no family, no career to protect (at best, he meddles in the running of Wayne Enterprises). He involves himself in the Justice League when it suits him. Hell, he barely has a secret identity these days, as both Lex Luthor and the Joker apparently know that Bruce Wayne is the Batman. If crime vanished overnight, Batman wouldn’t believe it. He’d lurk in the Batcave, drawing up plans and stratagems, amassing an armoury for that inevitable day when crime returns. Of course, chances are he’ll have inadvertently provided the means for that resurgence, but no one’s perfect, right? (As an aside, this is one bit of The Dark Knight Rises that I think is right on the money – Bane couldn’t have achieved a lot of his goals without that stockpile of pseudo-Batmobiles). Bruce Wayne doesn’t want a normal life, because Bruce Wayne doesn’t really exist. He’s Batman. He is vengeance. He is the night. By contrast, Superman – despite his vast, fluctuating power set – wants nothing more than to have a normal life. He has a job, he’s invariably portrayed as either being married, or in a stable relationship. He has a family that loves him. Superman aspires to have those things that the rest of us take for granted, and fights to keep them no matter how many alien invasions, variants of Kryptonite and supervillains come his way. Yes, you can argue that it’s easier for Superman to balance the two sides of his life. After all, he’s Superman. He can leap tall buildings in a single bound. He has X-ray vision. He can punch so hard that reality trembles (I wish I were joking about this). Yet I’d argue that there’s very little that Superman’s powers accomplish that Batman doesn’t achieve through his impressive stockpile of money. No matter how grounded the retelling of the Batman story, he manages to counter pretty much any enemy scheme through either outrageous technology (giant mech suits, nanobots – you name it, Batman has violated someone’s patent for it) or simply by possessing a level of inside knowledge that makes the ending to an Agatha Christie novel appear carefully signposted. (I’ve half-written a dozen superhero miniatures games over the years. The one consistent rule between all versions? Batman can re-roll one dice every turn. Why? Because he’s Batman. There’s a reason for that.) Don’t believe me? Well, I’m pretty sure we’re going to see Ben Affleck go punch for punch with Henry Cavill next year. Honestly, Superman isn’t more powerful than Batman. They’re just different. Supes’s powers come from his Kryptonian DNA, Batty’s powers come from his money, and his borderline-psychotic focus. You can argue that this isn’t realistic. On the other hand, I think that as soon as you start arguing about whether a billionaire can beat an alien in a fistfight, realism’s no longer a factor. So, why is Batman more popular? Well, I think it’s not about power. It’s about responsibility. Batman represents a freedom from responsibility that few superheroes get to practise. Spending every night on the streets of Gotham is what he wants to do. By contrast, Superman embraces the responsibility that Batman rejects. When Clark Kent does his Up, Up and Away routine, bringing Mongul’s latest rampage to a close, it’s for no better reason than because he can, and because it’s the right thing to do – not because of a promise he made to his murdered parents. Batman makes life better for ordinary people by making life worse for criminals. Superman makes life better any way he can. To steal from the House of Ideas, if Batman is power, then Superman is power and responsibility. Even amongst superheroes, Batman is a power fantasy. He represents a freedom that none of us can truly attain, but all of us secretly wish we could. His life is one long, cathartic pursuit. Granted, if most of us had Bruce Wayne’s degree of latitude, we’d spend it doing far less useful things than fighting crime – the real world has plenty of billionaires who prove that point better than any words of mine ever could. That’s what makes Batman a hero. But when was the last time you saw Batman – any iteration of Batman – rescue a cat from a tree? Or talk down a suicide? Or comfort the bereaved? Or one of a hundred little, seemingly innocuous things that make someone’s life a little bit better? To Superman, that’s Tuesday, fitted in between foiling Lex Luthor’s latest scheme and dinner with Ma and Pa Kent (if either/both are alive in this particular version of the story). I guess you could argue that this plays into the ‘Superman’s a goody two-shoes’ argument (also known as Superman’s too perfect). I hate that argument. It’s the kind of thing that leads to lazy parallels with Christ. You see, the problem isn’t that Superman’s too perfect. It’s that we’re rubbish. We’re secretly embarrassed that there could be someone in the world who, when push comes to shove, makes the right choice every single time. I mean, who wants to compete with that? Who wants the burden of inspiring hope? Not me. I have enough trouble tolerating humanity most of the time, without making you all feel better about yourselves. Nonetheless, I love the idea that someone else can. Why do I prefer Superman? In the final analysis, it’s simple. Strip Batman of his gadgets and his money, and there’s nothing underneath. Bruce Wayne is just the mask Batman wears. 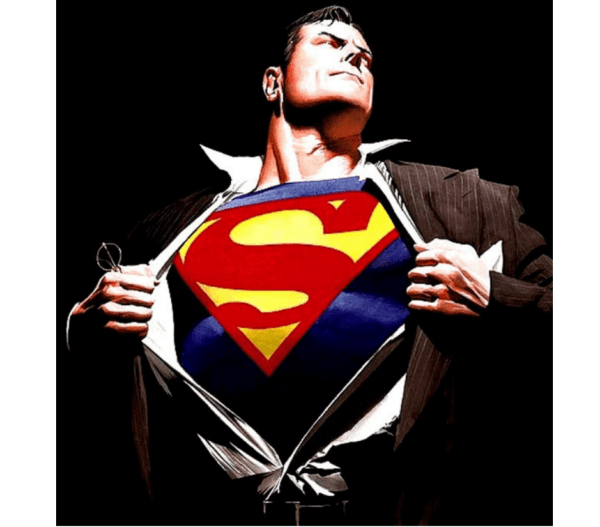 When you strip away Superman’s powers, you’re left with Clark Kent – a humble, honest, hardworking person whose ability to inspire remains intact. And that’s something we can all aspire to. Posted in Featured Blogs, Heroes for All!, Thoughts from the Tower and tagged Batman, Comics, DC, Superman.